★She had an 8 hour spinal fusion on her 1st three vertebrae in December 2012. ★ She was back on the treadmill 3 weeks after her surgery. I’m speaking of my Mom, Alice J Smoot. Her favorite activities are walking and swimming but lately she has been feeling the urge to jog. 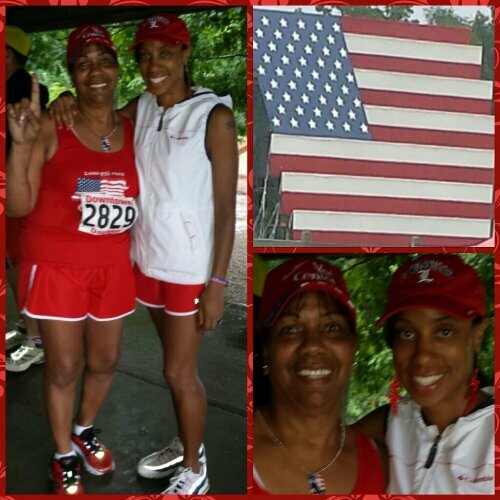 If you can recall my Mother’s Day post, I mentioned an expectation I had for my Mom to complete a 5k with me. I told her I would give up placing in my division so I could pace her throughout the 3.1 miles. The experience and bragging rights>>> any medal. First order of business was outfit selection. My Mom has an eye for fashion and can style with the best of ’em. We share a few of the same pieces and possess an ability to coordinate our color palletes with out prior planning. Leave it to me to add the 4th of July accessories. We snapped a couple pre race photos because it was shaping up to be a soggy morning. Good thing we took those photos because the ran became more steady as we drove down I65. We saw a car spin out and crash into a light pole. The pole fell down and the car straightened up his wheel and kept on driving. Lord help him! We arrived safely to Freeman Lake and parked with no problems. We were surprised to see so many people ready to run in all this rain! The sequin headbands came off. No need for the Elton John shades. We lined up and my Mom was sizing up her competition. We shared a few laughs as always. The rain kept pouring. After some announcements, prayer and the U.S. Athem, the race was underway. My Mom took off fast and I told her to slow it down and take control of the race. I gave her breathing, stride and posture cues along the way. It reminded me of the cues she would give me about my swim strokes back in the day. The course was tight with all the cars parked along the road. We spent a nice amount of time in the grass. This was not a good look and I was concerned about safety. Finally, we made it back on the asphalt. The race itself was unorganized as far as mile markers and routes for the 5k and 10k. Edit: An email came out about volunteers not showing up due to the heavy rain. That is both explainable and excusable. We followed along with the crowd but I think the 5k course was a tad bit long. My Mom did good throughout the race. Her breathing was a little heavy and she struggled here and there. We took walking breaks so she could regain control. The end result was my Mom earning her stripes by placing 1st in her division with a time of 38:08! How cute is her dog tag medal! On the drive home she offered it to me but I told her medals are earned and never given. She earned that bad boy! So what’s next for Mrs.Smoot? 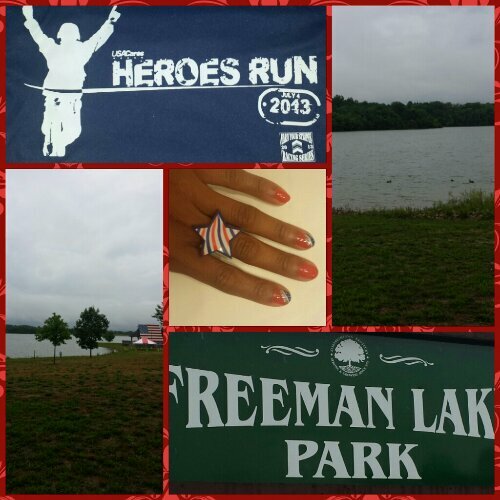 She has already made a goal to increase her endurance and is talking about doing another 5k!! 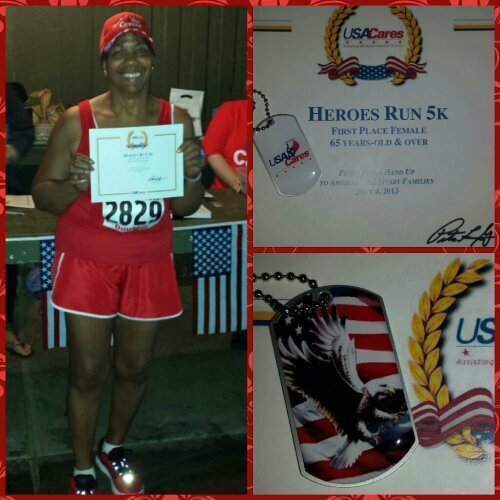 This entry was posted in Uncategorized and tagged 5k, family, military, Running. Bookmark the permalink. Congrats to you both!! 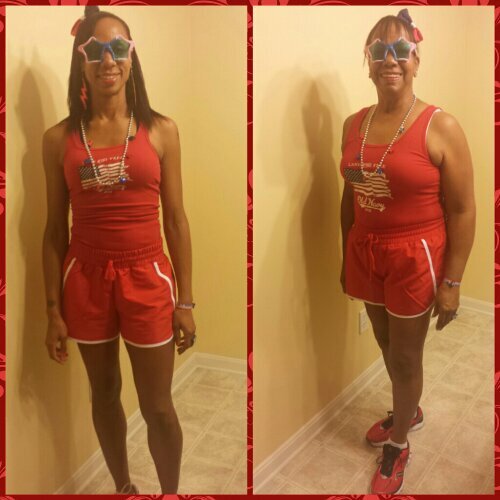 I am doing my first 5k in October (Detroit Marathon). You gals are great inspiration!! MBG- running your first 5k comes with a warning: once you get that running bug it’s hard to shake it! One of my favorite quotes. And…how awesome is this. Happiness! !